TNTET Exam will be conducted 29.4.2017 and 30.4.2017 for Paper 1 and Paper 2. This exam will be conducted in 598 exam centers. In this exam some new rules and regulations should be followed. Candidates can be allowed to the exam centers at 8.30 am, after checking candidates should allowed in the exam hall at 9.30 am. Candidates should be used black or blue ball point pen only for shading. Cell phones, calculators and digital wrist watches are strictly prohibited. Candidates allowed after thorough checking by frisking squad. Candidates must not mark any marks in question paper. Because its should be consider as a malpractice. If the candidates should not shade any answers till the end of the exam in the OMR Sheet also consider as a malpractice. Usually our website updates the tet exam answer keys instantly. 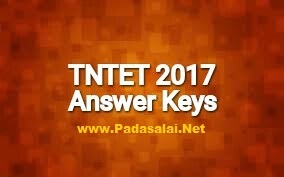 Likewise this tet 2017 exam answer keys also will be updated immediately after the exam closing time. In this process we upload the tet exam 2017 question papers first, and then upload some of important private institutes answer keys as soon as possible.